What ever happened to Boston Blackie? 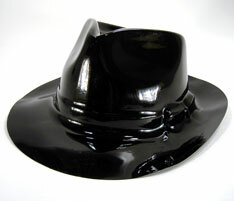 These are smart looking, Blues Brothers, Men in Black or traditional 1940s toppers. (We have the appropriate sunglasses too.) Made from tough glossy plastic in one size only – adult medium (about 7 ¼). Crown is 5 inches. Brim is 12 inches at widest point. Sold by the dozen. $5.20 per dozen for 24 dozen or more. $4.65 per dozen for 48 dozen or more.